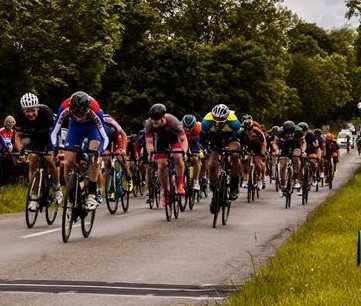 CYCLING: TEENAGE cyclist Harrison Knight took victory in what was his third ever road race at the weekend when competing in a sprint finish in the lanes of Inkberrow. In an incident packed race, the 17-year-old kept quiet in the peloton and made his way to the front of the bunch at the finishing straight – timing his sprint to perfection. He crossed the line a bike length clear of his closest rival, and the win marked what could be a defining moment in the young racer’s career. Riders can only race on the roads in the year they turn 17, and Knight joined 79 other racers as they strolled out of Inkberrow Village Hall. The field included three riders from Solihull CC, Harrison’s twin brother Jacob and Gary Blackman. There were a number of attacks off the front of the race, but all came to nothing as the group chased them down. A quick pace was set right from the start and up to 20 riders – who couldn’t sustain the effort – dropped away after 15 miles. A third of the way into the race, Harrison Knight attacked off the front and stayed away for six kilometres – at one time making a 43 second gap on the rest of the field. But with the strong head wind on part of the course, Knight realised the attack was to no avail and settled back into the bunch which was getting smaller due to the pace and one or two crashes at the back of the field. With seven miles to go, the race was neutralised due to a horse on the road and the commissaires decided the situation was too dangerous for all concerned for the peloton to pass. This caused a delay in getting the race restarted and riders who had been dropped by the peloton in the last ten miles found themselves at the back of the bunch once again and were able to contest the sprint. Knight meanwhile had kept quiet in the peloton before working overtime during the finish to win the race. He said after the race: “I’ve done a lot of training recently and felt strong today but I realised I couldn’t do a solo ride in the wind so took a breather in the bunch and made sure I was well positioned to sprint for home. The three Solihull riders travel to Shropshire this weekend to take part in the Mike Jones Trophy Regional Road Race, a hilly 109km race that rolls out of Leighton early on Sunday morning.